rv-pro.com September 2018 • RV PRO • 47 cabinet pulls and new linoleum color. The exterior will be an all-new millennial silver metal with a new graphics package that includes the Shasta wings. A new upgraded package option on deep-slide units is called the "Step Up Package" and includes a glass cooktop stove and oven, comforter bedspread, aluminum wheels, Solid Step by Lippert, power tongue jack and XL exterior grab handle. Lantz says new floorplans include the 25RK, which added a new entertainment area and linen closet. The 25RS, 26BH and 26DB have an added top double-bunk standard that was previously an option. The 30QB and 310K have been revised to increase the slide depth to a deep-slide, along with adding 2-by-3 floor construction and in-floor ducted heat. The 27BH has revised the bathroom/bedroom to make the bathroom on the passenger side with an entry door. Lantz says Shasta also is making a commitment to stronger web marketing and will include virtual 360s of every inte- rior, more than 25 photos of every floorplan, video of every floorplan, and a link to online owner's manuals with pictures and "How-To," information on the website. There also will be a downloadable Shasta RV App. Coachmen Laminated Trailers Coachmen's Apex and Freedom Express travel trailer lines will be showcasing a mix of new and updated products for dealers during this year's Open House Week event. In the Apex line, the RV maker will debut the 293 RLBS Apex ultra-lite, which Sales Manager Kevin Silcox says will fea- ture the largest double-slide lounge for a travel trailer coming in at less than 6,500 pounds. The trailer also will feature a large entertainment center and a hide-a-bed. Additionally, Apex will be debuting the 226BH, which is an 8-foot-wide non-slide bunkhouse trailer. Notably, the trailer will feature an integrated front window as part of the Summit package. 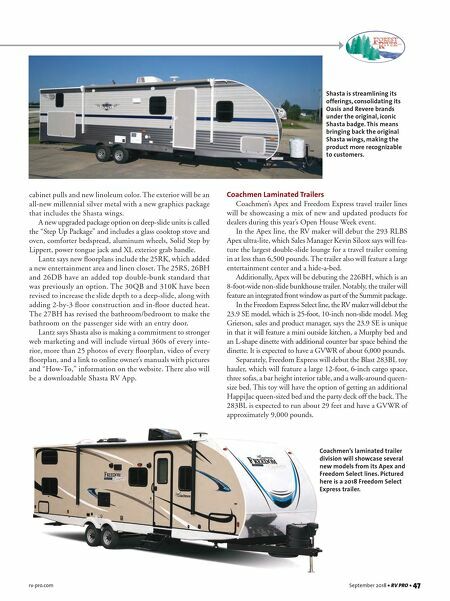 In the Freedom Express Select line, the RV maker will debut the 23.9 SE model, which is 25-foot, 10-inch non-slide model. Meg Grierson, sales and product manager, says the 23.9 SE is unique in that it will feature a mini outside kitchen, a Murphy bed and an L-shape dinette with additional counter bar space behind the dinette. It is expected to have a GVWR of about 6,000 pounds. Separately, Freedom Express will debut the Blast 283BL toy hauler, which will feature a large 12-foot, 6-inch cargo space, three sofas, a bar height interior table, and a walk-around queen- size bed. This toy will have the option of getting an additional HappiJac queen-sized bed and the party deck off the back. The 283BL is expected to run about 29 feet and have a GVWR of approximately 9,000 pounds. Shasta is streamlining its offerings, consolidating its Oasis and Revere brands under the original, iconic Shasta badge. This means bringing back the original Shasta wings, making the product more recognizable to customers. 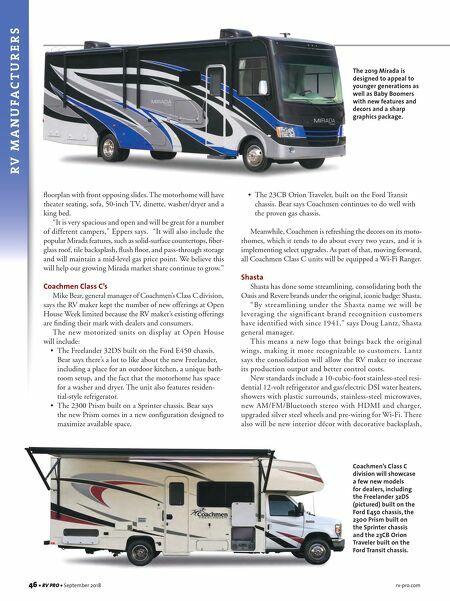 Coachmen's laminated trailer division will showcase several new models from its Apex and Freedom Select lines. Pictured here is a 2018 Freedom Select Express trailer.